Peter Pan is a little boy who never ages and never grows up, first introduced in 1902, in a novel by James Barrie. The character debuted to larger acclaim in a 1904 play, Peter Pan, or The Boy Who Wouldn't Grow Up . 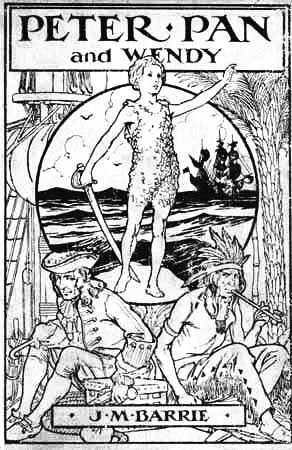 That play was expanded and published as a novel in 1911 where the title changed three times with future editions: Peter and Wendy , then Peter Pan and Wendy , and finally the title that stuck, Peter Pan . The Disney film provided wonderful enduring characters to remember. Our favorite was the protective dog, Nana, the Newfoundland. This book is featured in our collection of Books for Young Readers. Return to the James M. Barrie library.